The benefits of a pre-listing inspection. It's not immediately obvious to many sellers why a Pre-Listing Home Inspection would be beneficial. One of the most compelling reasons is the comfort factor it gives potential buyers. Trust Plays a Large Part in Any Transaction. Every legitimate effort you make to build trust with a potential buyer will bring them that much closer to making the decision to buy your property. It's very important to create "curb appeal" when placing your home on the market. That's the number one thing that gets a buyer interested. But once they take a closer look, they begin to decide whether your property is the one they want. Many things play into that decision. 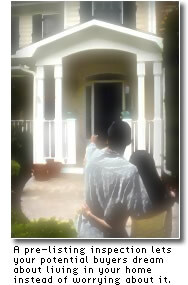 And trust about you and the property's condition is a key element. A Pre-Listing Inspection lets them know your property is in good shape. They'll feel good about you and the property. That can make all the difference. Give The Potential Buyer Peace Of Mind. Eliminate the need to concern themselves with the condition of the property. That allows them a much more relaxed perspective on the lifestyle aspects of living there. It allows them to concentrate on seeing themselves as the owners, without clouding their thoughts with worries of whether the property is a good investment. They can dream. Which is exactly what you want them to do. A Pre-Listing Inspection Also Strengthens Your Position as a Seller. Sell your Home For More. In the State of Georgia, sellers are responsible for providing a Seller's Property Disclosure Statement. This lists all known problems with your property. Your Pre-Listing Inspection supports your disclosure claims. By having an inspection before selling, you're prepared for items that may show up during the buyer's inspection. You can prevent extended negotiations if the repairs are made ahead of time. You'll have the time to find reasonably priced contractors or make the repairs yourself, if qualified. Fewer contingencies in the sales contract will undoubtedly make the closing much smoother. It reduces your liability by adding professional, supporting documentation to your disclosure statement. You will be able to negotiate from a much stronger position if you have an inspection report to compare against your buyer's report. In many cases, if your report is provided by a certified inspector, the buyer will see no need to retain their own inspector. You'll immediately see the advantages it provides you as a seller. If you have any questions about pre-listing inspections, just give me a call. You won't run into high pressure sales tactics. Just honest, informative answers to your questions. I'll be pleased to assist.